ANNOUNCEMENT OF EHEF KAZAKHSTAN 2015! 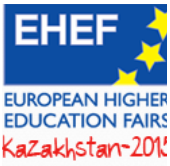 The European Higher Education Fairs in Central Asia and Asia project is pleased to announce the dates and location for EHEF Kazakhstan 2015 – this Fair will be held in Almaty, on Sunday 27th and Monday 28th September. Venue to be confirmed. The Fair, the second to be held in this project series (following EHEF Vietnam held in November 2014) will bring together exhibitors (higher-education institutions, and national-level representations) from across the European Union to showcase study opportunities in Europe to students interested in Bachelor’s, Master’s and PhD level programmes.